It may seem strange in this age were a veritable avalanche of science fiction and fantasy books are published that there was a time, not so long ago, when this was a new form of popular story telling. Science fiction may have exploded during its golden age in the nineteen forties and fifties which gave us all the great masters of the genre, but even these only stood on the shoulders of the original master of the genre, H. G. Wells. Wells’ form of scientific romances made popular such tropes as time travel and voyages into space. While he was undoubtedly not the originator of these ideas, his popularity as an author brought these outlandish ideas to a mass audience. The Time Machine (2017. 119 pages) is a novella whose popularity resulted in several television and film adaptations as well as radio plays. The story follows the enigmatic time traveller who gathers a group of friends together to explain his plan to travel through time. His guests remain sceptical but agree to meet once again in a week's time. When they arrive, there is no sign of their host until he appears clearly in a dishevelled state. After he cleans himself up he starts to recount the strange tale of his journey into the future. While Star Trek is often held up for its ability to address social issues under the guise of science fiction, Wells got there first. The book was originally published in 1895 and, in the main, it was a reaction to what he perceived to be social inequalities in Victorian society. The culture that the traveller visit is split between the languidly docile Eloi and the below dwelling Morlocks, whose technology and work allow for the near paradise which exists above ground. The Time Traveller discovers that this paradise comes at a horrific cost as the Morlocks have taken to cannibalism and the comfortable lives of the Eloi are synonymous with that of domesticated cattle. The book still holds up well even today with one caveat. The passing of time has made a lot of the references Wells uses, which would have been familiar to his contemporary audience, a little on the obscure side. Fear not,dear reader, as this imprint from Oxford World Classic comes not only with an insightful introduction, but it is also annotated with notes on the text. The breadth of useful information is extended with three appendices, The New Review: The Further Vision, H. G. Wells, Zoological Retrogression (1891) and H. G. Wells: On Extinction (1893). 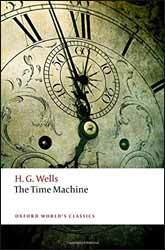 To round the book out you also get a Chronology of H. G. Wells and a Selected Bibliography. This is a great presentation of the novella with lots of supporting text which stay the right side of academic writing to appeal to a wide audience.